From his backyard in Östersund, Sweden, professional photographer and astrophotographer Göran Strand took a look at the sun using his portable solar telescope “to see if something interesting was going on.” And sure enough, there was something VERY interesting going on. Something was towering over the solar disk — something that looked like… the Eiffel Tower? Of course, this isn’t the famous Parisian landmark, nor is it some Photoshop trickery; the structure Strand had spotted was a solar prominence, and a beautiful one at that. Colorized version of the 'Eiffel Tower' prominence compiled from 300 solar observations. In the final image, the size of the Earth has been added to give a sense of scale. 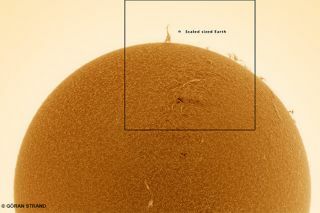 A rough comparison suggested that this prominence is approximately 7-Earth diameters high, reaching high into the sun’s atmosphere (the corona). Prominences are large structures of magnetized plasma that can erupt from the sun’s chromosphere and arc high into the corona. As the plasma in the sun’s corona can have temperatures exceeding a million degrees Kelvin (Celsius), the plasma in prominences can be a hundred times cooler, at a similar temperature to the chromosphere. Also, as the sun is rich in ionized hydrogen, astronomers use hydrogen alpha (or H-α) filters to produce observations of stunning detail of prominences and chromospheric features on the solar disk. For more of Strand’s outstanding work, check out his website, Instagram, Twitter and Facebook. The original, black and white view of the sun and prominence (in the lower-right).